Stella Klein-Löw was born in 1904 in the Galician town of Przemysl. Her father Samuel Seinwel Herzig, had been born in Prezemsyl a good thirty years earlier on the 6th of February 1875, while her mother Frime Rebeka (who went by Regina) was born on the 29th of November 1882 and was from Brody. Stella’s younger brother Jakob joined the family on the 25th of August 1911. Her father was the director of a shipping company and his wealth allowed the family to lead an upper-class lifestyle. Therefore Stella also had a nanny named Juschka. It was through Juschka that Stella was confronted at an early age with the poverty that her nanny was living in, raising and shaping her social awareness. With the outbreak of the First World War imminent, the Herzig-family migrated to Vienna, Austria in February 1914.Here Stella attended “Unterrichtskurse für galizische Mädchen“ (Classes for Galician Girls), before she changed to the “Privat-Mädchen-Obergymnasium des Vereins für erweiterte Frauenbildung“ (the Association for Further Women’s Education’s Private High School for Girls) in the sixth grade, from which she graduated in 1923. 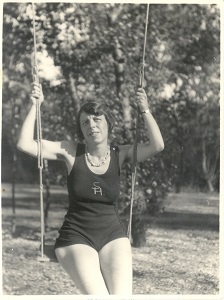 Stella Klein-Löw belonged to a subgroup of the Viennese Jewish community which is rarely recognized, namely the assimilated Galician middle class. “My parents were enlightened Jews”, Klein-Löw explains in her autobiography. “None of us went to Temple, and we never prayed either.” During her childhood she was deeply influenced by art and culture, as well as the political discussions that went on in the household. When the family lost all their money in World War I, Stella was expected to begin earning her share of the family upkeep from a rather young age. She started tutoring when she was in middle school, a job she kept throughout her university-career, contributing to her working class experience of (young) adulthood. When she was 16 years old, Stella became a member of the Young Socialist Workers; two years later she joined the Social Democratic Workers’ Party. Her diligence and enthusiasm earned her recognition and respect among the party members, despite her being a student. As a person of trust, Stella visited many of them at home and gained an insight into the hardship and squalor in which the workers had to live. Two to three times a week she also worked at the ninth district’s workers’ library and joined the Socialist Students of Austria, a small left-wing oppositional group under the leadership of her eventual husband-to-be, Hans Klein. Although she was very involved with the party as well as her tutoring-job, Stella succeeded in her German and classical philology-studies and graduated from university with a doctorate and a teaching qualification. Since her broad interests and ambitions had not been entirely satisfied by this field of study, she attended seminars in psychology with Karl Bühler and worked at an institute for adolescent psychology run by his wife Charlotte Bühler. It was her work with Wilhelm and Anna Reich in particular though, which led Stella to conclude that she had found her vocation in psychoanalysis. However after her husband’s suicide, she was too devastated to continue with self-analysis: “So I stayed in school with the ambition to be a professor who was also a politician, psychologist and psychoanalyst.” It would turn out to be the right decision. After Austria’s annexation to Hitler-Germany, Stella, her brother, and her mother had to flee to England, where she was initially hired as the domestic help, housekeeper and governess to a mentally handicapped child. She married the Austrian physicist Moe Löw in 1940, who had come to England after being released from Dachau concentration camp. Thanks to her connections in English socialist circles, Stella managed to procure a position as a governess at a reform school for boys where she worked until the end of the war. When the war was over, Stella temporarily took up working with young survivors from the Bergen-Belsen concentration camp until finally returning to Vienna with her husband in 1946. She explains, “As Austrian Socialists, we wanted to live and work in Austria, occupied Austria at that: personally, professionally, and politically. […] ‘New Austria- old home country’- we saw it as an adventure and were drawn to it. And we would have felt ashamed to abandon Austria, Vienna, Socialism, especially at that point in time to sit it out and wait for the hard times to pass.” She goes on to describe that they returned to Vienna “with neither illusions nor resentment”. Stella took up teaching again, working her way up to headmistress at a middle school, while also managing an impressive political career: She managed to accept that some of the other party members had a recent history of National Socialist-affiliations, without forgiving and forgetting any of their (former) convictions, missteps and crimes. As a member of the central committee, she too was in line with the postwar-SPÖ’s reformist course of politics and actions. From 1959-1970, she was Leopoldstadt’s candidate for the National Assembly of Austria; her main focus in politics was on education. Stella Klein-Löw describes that the return to Leopoldstadt in Vienna’s second district – once the part of the city most densely populated by Jewish people- was not easy for her. The memories of the persecution that her students suffered after Austria had been annexed were too close, too haunting. “I saw in front of me the bleeding, oozing scars in the faces of on the heads of the boys whose sidelocks had been ‘shaved’ with graters by SA- and SS-heroes.” Ultimately though, her love of people won out and she opened up to the Leopoldstadtians, managing to establish trust and friendship with them. It was only then that Stella was able to fully overcome her prejudices towards the orthodox “Eastern Jews”: “I changed my approach to people. Every last trace of discrimination disappeared. 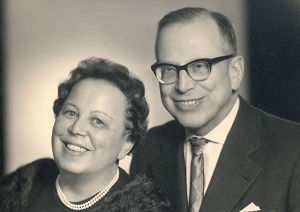 I was left with nothing but a great sense of awe that I had at one point or other actually judged people according to whether they spoke proper German or Yiddish, were from orthodox or more assimilated families.” Stella Klein-Löw was also invested in bettering the relationship between Austria and Israel and was head of the board for the Austrian-Israeli Community. She died in 1986 in Vienna.